COLOR: shades of emerald green as well as white, gray, yellow, orange and violet. 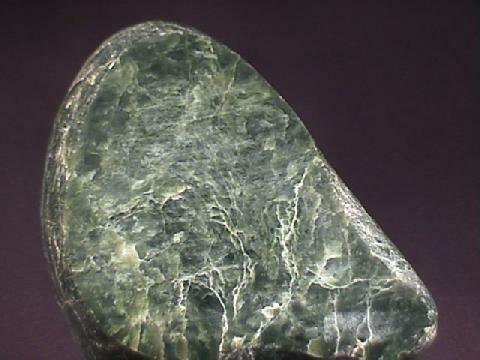 Jade is a name that was applied to ornamental stones that were being brought to Europe from China and Central America. It wasn't until 1863 that it was realized that the name "Jade" was being applied to two different minerals. The two minerals are both exquisite for the purposes that jade is put to task and are hard to distinguish from each other. So what to do? Leave it alone and call them both Jade! Today jade is still valued for its beauty. Its many colors are appreciated, but it's the emerald green color (that jadeite produces so well) that is highly sought after by artwork collectors. This emerald green jade called "Imperial Jade" is colored by chromium. Other colors are influenced by iron (green and brown) and manganese is thought to produce the violet colors. Nephrite is usually only green and creamy white, while jadeite can have the full range of jade's colors.